Annual green “supermarket” broccoli is the most recent addition to the family of vegetables derived from this species, but may be the oldest in terms of ongoing development. The Italian, “broccoli” , was originally a name given spring floral shoots of any Brassica, including wild coastal kales, primitive garden kales, and turnip mustard (“broccoli raab”, see Mustard: Japonica). 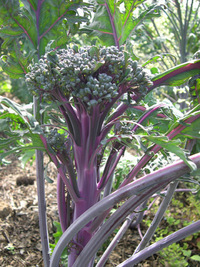 The original broccoli always overwintered, and then produced numerous tender shoots from loose sprouting heads. These are now called “Calabrese” or “sprouting” broccoli to distinguish them from modern dome-headed types that crop the same year they are planted. New cooking trends are favoring a return to more of a “loose-shoot” approach to broccoli in the marketplace, so maybe we will be seeing more of this vegetable’s diverse possibilities soon.